I look at Cook, Serve, Delicious! I've been playing a ton of Cook Serve Delicious over the past two weeks and boy is it fun. In its most simplistic form, Cook Serve Delicious (Henceforth referred to as CSD) is a stressful microgame collection glued to a restaurant management sim game. It's also very indie, not sold on steam yet and programmed in Game Maker, I suppose that taking a look at smaller games should be made with a more forgiving mind, but the ideas and designs can still be judged on the same level. 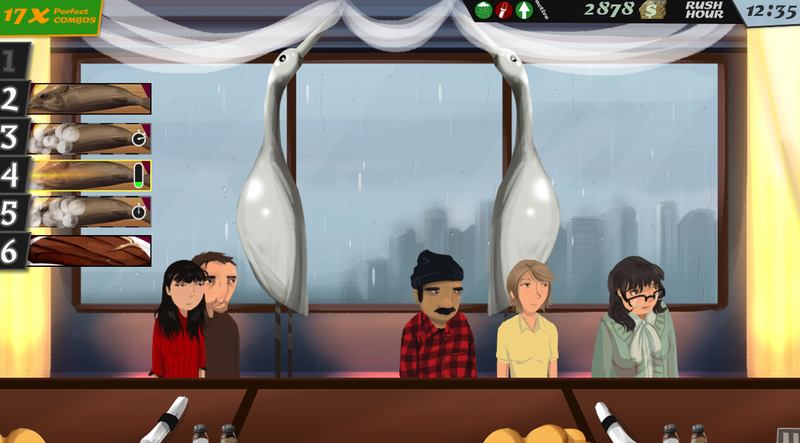 The game is a loop of alternating cooking and management sequences. In the management section of the game, you purchase, upgrade and choose foods to be on your menu, you buy equipment to help your restaurant run smoothly and you read emails - flavor text and useful info from the game, sometime with money bonus or little side missions. The goal of choosing properly your foods is to stuff your restaurant with high-paying foods that you get used to make. All foods have different 'micro-games' associated to them. For very simple foods such as the Corndog, it might be to press K for ketchup and M for mustard. Some more complex ones such as Soup require you to memorize multiple key sequences for different recipes. The chicken soup is K W U then Shift, then Y then the down arrow key three times. You also pick up menu items that will generate Buzz for you. 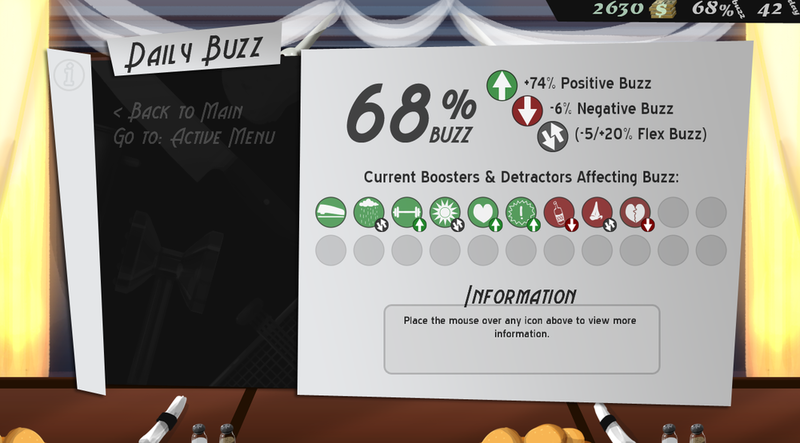 Buzz represents how much people will come to your restaurant which translates to more money. Some foods have to be phased out of your menu every two days, some are staple and will be popular forever, some are healthy and generate more buzz, some create more chores for you to do. There are five chores in CSD and they happen during the cooking hours. Cleaning the toilet, washing dishes, hauling out garbage, setting up rat traps and catching burglars. Your restaurant upgrades will make these chores easier, you can also buy a tip jar to get extra money and some items to make your customers wait longer before you serve them. A problem I've encountered with the whole management aspect of the game is that every restaurant upgrade is available really soon. I manage to buy the upgrades that made my chores easier really quickly, I even got the gun control upgrade (Reduce chances of theft) before I ever saw a burglar in my restaurant! When you've upgraded everything in your restaurant, you're left with food upgrades and these get trickled down as the game decides. Food upgrades are interesting because they raise the price of your food items but they most often then not increase their complexity. Some recipes are the exception, such as chicken (The minigame is always to tenderize the chicken exactly six times then season it and cook it) where the upgrades only increase prices, but things like Salad add new ingredients and new recipes, making these foods harder to prepare. You need to upgrade your foods if you want to rise to higher star ratings, so at one point you're going to make more difficult meals. Adding upgrades to help you prepare specific foods would be helpful and interesting. With about 25 different food items there are still more ways to prepare them. The upgrades don't need to be spectacular, for instance the Wine item is served by tapping the Up arrow key until you pull the cork out of the bottle. Why not add a corkscrew? You'd press C to use it then hold Up instead of taping it. Or maybe items that stop the cooking process of meats when they're done? Automatic ice dispensers for the soft drink machine? By adding restaurant upgrades to more items besides the basic chores there will be a sense of progression towards unlocking things to help the player. Another neat upgrade idea I've had is a list of recipes cards you could hang around somewhere on-screen for a quick refresher at your most used items. I've had to memorize all soups and I dread upgrading them, for it will mean having to learn even more soup patterns. KWSP Shift Y down down down L down down down anyone? Is this the konami code or soup? When you're in the cooking portion of the game, it's a restless free-for-all of action where people line down in your restaurant and ask you for things. You start with 4 cooking stations which means you can serve 4 people at once (This number gets upgraded whenever your restaurant rises in star rating) and it becomes quite stressful to deal with everything. Rush Hours make people come in droves to your establishment and by then you really need to calm down and process each order masterfully. Some need to cook for a while, some are complex key presses (Lasagna), some rely on memory (Steak) and others on precision (Beer). If you mess up an order a little, you'll get an "Okay" rating instead of Perfect, if you mess up alot, you'll get a "Bad" rating, which generates negative buzz for the following day. There is something frustrating about the binary nature of certain decisions in the cooking process. I understand that serving the wrong meal by pressing a different key that you intended is an honest mistake that can only be blamed on the player but what I can't understand is the fact that once you've messed up an order, you have to serve it bad. This is especially frustrating because you get multipliers for each perfect orders you make and you get a money prize each day you complete with 100% perfect orders. As an example, the process of making salad is complicated by the fact that you have 8 ingredients with similar starting letters, Thousand Island Dressing, Vinaigrette, Ranch, Cheese, Bacon and croutons, onions and peppers, greens and carrots, tomatoes and mushrooms. If someone asks for a salad with ranch, cheese, tomatoes and mushrooms and you hit R C T, you've messed up, tomatoes and mushrooms is linked to the "M" key, so you've messed up this salad. And you have to serve it. You know it's a bad order but can't do anything. Wine is also pretty finnicky, when you upgrade your wine, you actually add new wine selections to your menu. If you have wine A, B and C and someone asks for wine B and you tap the up key ever so slightly on the wrong bottle, that's it, you have to finish the job and serve the wrong wine even tho all you did is start popping the cork about a millimeter. Allow the player to trash any messed-up order. Maybe add a cash penalty so it's not inconsequential or just leave the time wasted preparing the wrong order as the downside. Some parts of the process can't be rolled back, such as giving the wrong order to a customer (I'm not advocating for a 'Are you sure you want to give this order to that client?' prompt every time you serve someone, that would ruin the flow of the game) but I sincerly doubt that chefs go "Oops, dropped two pounds of beef in that chicken soup! Oh well, gotta stick to it!". I know, this is not a simulation game with realism cranked up to 11, but having players make frustrating actions is not a fun thing.